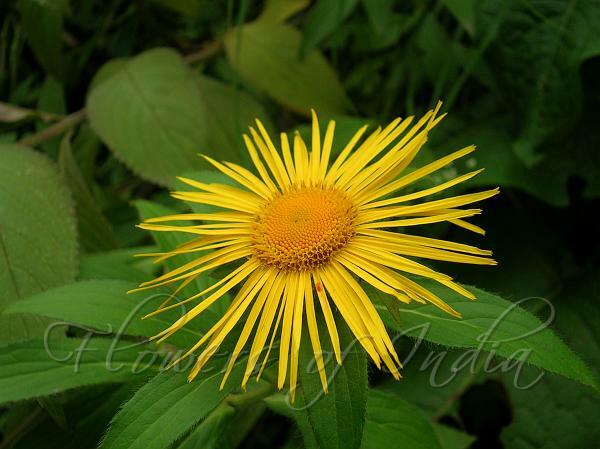 Showy Inula is an attractive Himalayan plant, with golden-yellow flower-heads at branch-ends and solitary, 4-6 cm across, borne on erect leafy stems. Ray-florets are narrow, very numerous, up to 2 cm long, 3-lobed at tip; involucral bracts with bristly-haired teeth, the outer leafy and as long as the florets, the inner shorter linear, all bristly-haired. Leaves are oblong-lanceshaped pointed, 5-7.5 cm, lobed at base and with glandular teeth and bristly hairs on margin. Stem is unbranched, leafy throughout, 30-45 cm. 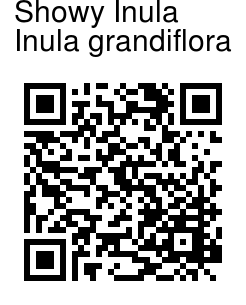 Showy Inula is found in the Himalayas, from Pakistan to C. Nepal and W. Asia, at altitudes of 2000-3300 m. Flowering: July-September. A postal stamp was issued by the Indian Postal Department to commemorate this flower.